I was looking for that picture of us as small children with our rabbits yesterday and I found it. It was a good memory to share. I have so many pictures that tell a story just by looking at them. It really is true that a picture is worth a thousand words. Cathy and me in my bedroom with Tiny Tim Carlos Chico Pisarkewicz Prescott. I stopped to ponder it for awhile yesterday and then I showed it to Steve last night. “There is so much going on in this photo,” I said to him. First of all, there is that room. It’s the basement bedroom in our house on 105th Street in Omaha. Daddy and Mommy bought that house in September, 1965. There were seven of us kids at that time and it was a small three bedroom house. They built an addition in the spring that included one bedroom (a small master), a bathroom to go with the only other one in there, and an informal dining room off the small kitchen, where we ate our meals. Mom died that March, never really able to enjoy the house or raise her family. But that basement bedroom became a place of so much fun! After Daddy remarried and Heidi, Heather and Greg joined us, we became a family of ten children living in that slightly larger house. At one time, five of us girls shared that bedroom in the basement and had epic games of blind man’s bluff where only the blind man could touch the floor. The other four had to go from bed to dresser to desk with a swing through the closet to keep away from becoming the blind man. That is a story in itself. But on the walls of that room in this picture is the wallpaper I picked out. There used to be some gray paneled wallboard and I thought it needed some color. We bought that wallpaper on a sale table at JC Penney. There was no sample, just rolls of what seemed a good choice of green and lavender. It went with my sheets and Daddy said, “Okay.” We didn’t ever see the pattern until he unrolled it to put it up. And then we had to live with it, but hey, it was the 1970s and we thought it was cool. I crocheted that afghan, granny squares, in one of my early attempts at the needleart. I always loved it. And you can see the hint of a green quilt there, too. That was my very first quilt! I made it from green sheets on a treadle sewing machine a decade before I really learned how to quilt. Sewing on that machine which I had acquired from an estate sale run by my cousins made me think of my mom. She had a similar machine that she made clothes on for us when we were very small. And look at that awesome stereo! I bought that with my high school graduation gift money before I went to Lincoln to go to college. It cost $75 new at Target AND it had an eight track player in it. For whatever reason, it was so cool to have an eight track and it didn’t seem to bother us when the track switched in the middle of a song. Who would put up with that now? That dog was Tiny and he was my dog, even though we all picked him out from the Humane Society. When he came home with us when I was a sophomore in high school, he never slept anywhere else but with me. He would crawl under the covers with me at night and curl up in the warmth at my feet. This picture had to be taken when I was home for the summer, because once I came back from Lincoln for good, I had a room upstairs. But the thing that really made this picture so valuable to me yesterday is that Cathy, my baby sister, is sitting down there on the bed with me and Tiny. I have no recollection of when or how this picture came to be taken, or even who took it. But I am struck that Cathy and I are in it together. I remember making that blouse I have on and I remember those John Denver-style glasses I always wore. I remember the wallpaper and the bed and the afghan and the quilt and the dog. I don’t remember that day or that moment, but I do remember Cathy’s smile. This was before she ran away from home because of the pain caused by our stepmother, she who is not to be named. This was before her health failed and she lost a lung. This is before her multiple times in the hospital as a patient, called her to be a healer and go to nursing school. This was before she had a stroke at 40 that robbed her of speech and good use of her hands. This was before she moved away from us to California and crossed paths with the man who murdered her. This was before we got word that his competency hearing has been delayed again and some form of justice for her death seventeen months ago is put off for at least two more months. This was before the millions of tears we have shed since her loss on March 24, 2013. 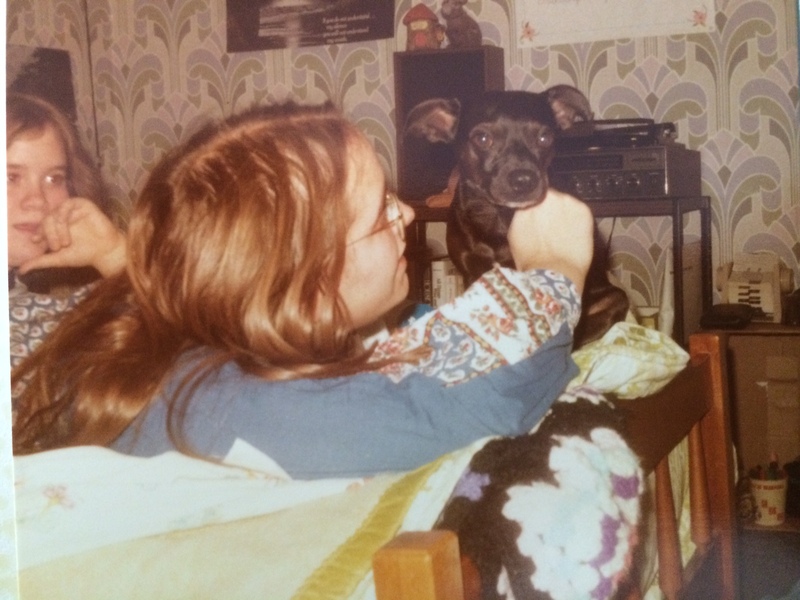 But there is a moment when we were younger sister and older sister, sitting in a cherished room on a bed full of memories with our sweet little Chihuahua terrier mix. And that is the 1000 words that this picture tells for me on this day. Thank you for sharing this……the memories it conjures are strong and make me smile and cry at the same time. I remember that wallpaper too. Yeesh! And although Cathy and I never got to “room” in the basement room, we aspired to it! And I did have the top bunk, upstairs.